Friday was an incredibly sad and frightening day as news came in of the horrible attack on Paris. 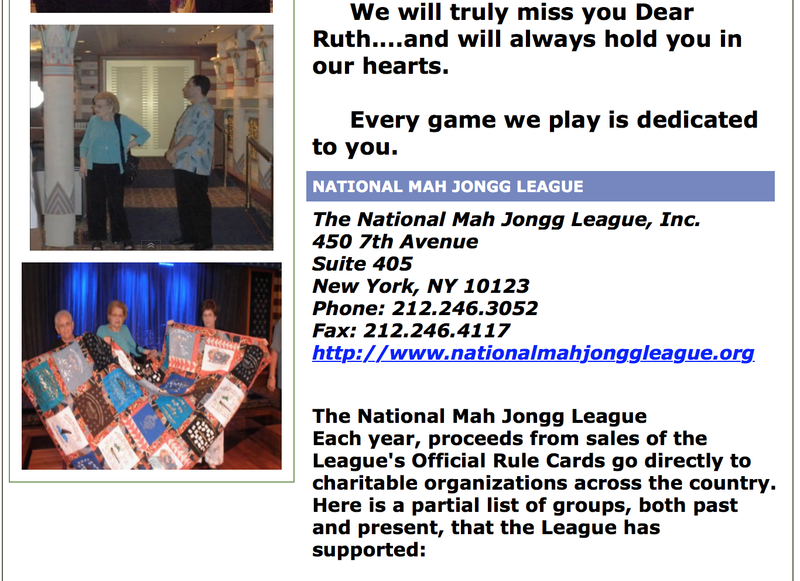 And then, later in the evening, an email arrived from Gladys Grad, the Grand Master of American-Style Mah Jongg, bringing more sad news but this time specifically to the Mah Jongg community: Ruth Unger, the long-serving president of the National Mah Jongg League has passed away. Our thoughts and prayers are with the citizens of France while at the same time we send our condolences to the family of Ruth Unger. 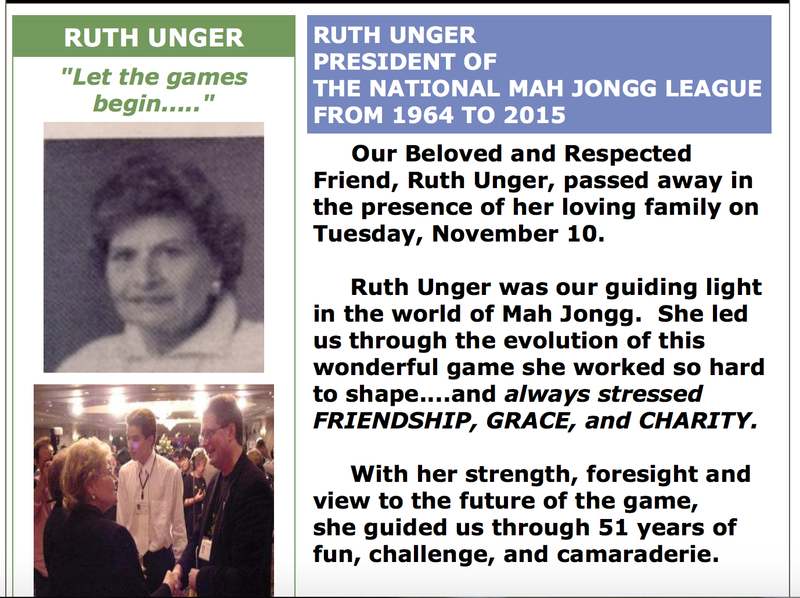 This entry was posted in Mah Jongg and Me and tagged France, Gladys Grad, Grand Master of American-Style Mah Jongg, mah jongg, mahjong, National Mah Jongg League, nmjl, Paris, Ruth Unger on November 14, 2015 by Mah Jongg and Me. A truly sad time for all of us Mah Jongg players. I personally feel the loss. 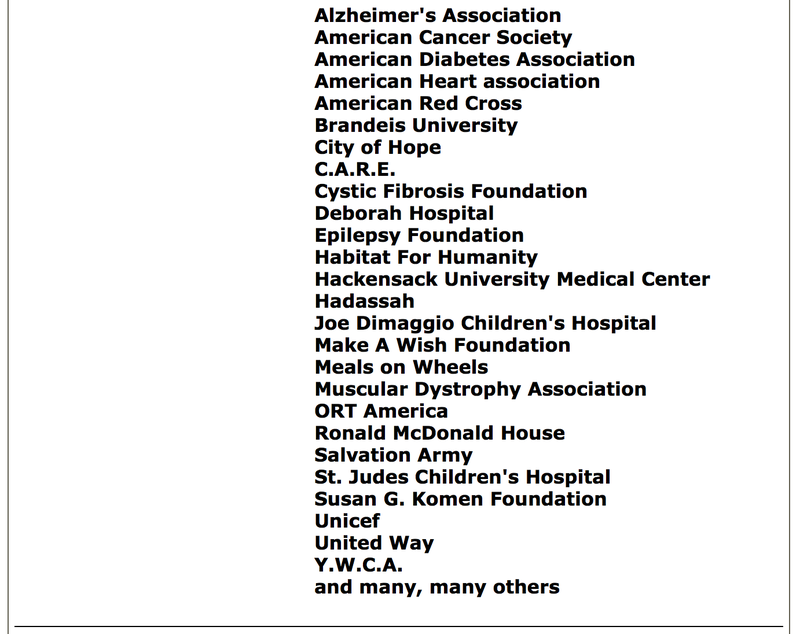 After reading an article I wrote in our Naples Letters to the editor letting all know the charities Mah Jongg League donated to and to let all know they were not just for profit,, Ruth Unger personally called me to thank me for my letter. Phyllis C.
My mother Alice played in the Tuesday evening game with Ruth in the Bronx, back in the Sixties. What a full life she had! May her memory be for a blessing. Ruth was one of my mom’s best friends. A lovely person, so gracious. Baruch Dayan Emet.